Found 24 file extension associations related to SmartDraw and 4 file formats developed specifically for use with SmartDraw. 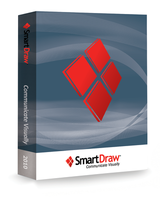 SmartDraw is a visual processor that automatically formats your visuals as you create them. SmartDraw's ease-of-use makes it possible to quickly create a variety of professional-quality visuals. SmartDraw includes hundreds of pre-drawn templates for more than 70 types of visuals, including flowcharts, mind maps, project time lines, organization charts, colorful 3D graphs, floor plans, country maps, network diagrams, and landscape plans. With SmartDraw's Import/Export functionality, you can open and edit Visio files, export your visuals to Microsoft Word® or PowerPoint® with a single click, or publish your visuals to Microsoft SharePoint from within SmartDraw. If you need more information please contact the developers of SmartDraw (SmartDraw, LLC), or check out their product website.